What do your high school courses reveal to college admissions officers? Actually, quite a lot. About this time of year, students pick courses for their next year in high school. This makes now a good time to talk about course selection and why it’s important. You probably don’t think too much about your high school courses, but they can be a strategic tool for enhancing your college application, and at the same time improving your education. So in this post we’re going to focus on why the high school courses your choose are important to colleges. There are two important reasons to pay close attention to the course selection process in high school. First, your high school courses can greatly affect your preparation for college. This is true not only in terms of the subject content you learn, but also in terms of the critical thinking, analysis, and other problem solving skills you acquire while you learn that content. The better your education before college, the more successful you’ll be when you get there. Second, the courses you select can give you an advantage when you apply to college. This is especially true if you’re applying to Ivy League or highly competitive colleges where everyone has very high grades and test scores. You can use your high school courses and experiences to make yourself stand out from other applicants and reinforce other areas of your application. Before we continue, I want to briefly talk about something very important — deadlines. You need to submit your course choices by their due date. If your selections aren’t in when the master schedule is created, someone else will choose your courses for you. You should also know that once your selections are made, it’s often very difficult to change them until after the scheduling process is complete. Schools need to plan for, create, and lock in class schedules so that students get the courses they need to graduate. Letting students constantly change courses while schedules are being created causes major problems with class sizes, teacher staffing, and schedules. As a result, you may be prevented from making any changes until the schedule is done. Therefore, make your choices wisely. Don’t risk having to take a course you don’t want because you didn’t put enough thought into it when you selected it. If you do need to change a course, most schools will make you wait until either school starts or scheduling has been completed. If your school allows changes once the schedule is complete, that’s a line you want to get into pretty quick. Be aware that once all the students are scheduled into classes, you may have a problem getting the course you want because there isn’t room. You may need to change your entire schedule just to get that course. There are two things colleges look for when they examine your high school courses. Most colleges want you to take a specific number of courses in a subject before you enroll. Students who have done that have a better chance of being accepted than those who don’t. 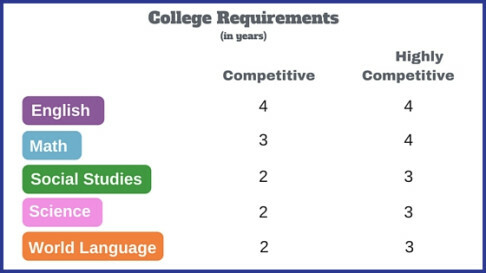 Not all college requirements are the same, but they’re pretty similar depending on the competitiveness of the college. Many colleges publish their academic course requirements on their websites so that’s a good place to look if you’re interested in knowing what a particular college requires. Admissions officers are looking for the best academic students within their pool of applicants. So one of the first things they look at on your transcript is the difficulty of your courses.
. . . and what exactly do they look for? Well, besides your grades, they want to know how challenging your courses are. The academic level of your courses will give them that information.
. . . and what does “academic level” mean? Most high schools have courses that accommodate students with different performance and academic abilities. For example, a high school may offer three different 9th-grade English courses, each representing a different academic level and serving students with different abilities. Here’s an example of what that might look like. The honors course would be the most challenging course on the list. Your high school may use a different way to identify academic levels, like 1, 2, or 3; Level A, Level B, or Level C; or some other system. If you’re wondering how an admissions officer knows which course leveling system your high school uses, it’s actually quite simple. When your guidance office sends your transcript to colleges, they send along with it a document called the School Profile. The School Profile includes a description of the academic levels your high school uses, along with other information about your school that college admissions officers use to understand your transcript. Getting back to your courses. Obviously, the more challenging your high school courses, the more interested colleges will be in your application. Now, I’m not advocating that you take courses that are “over your head.” In fact, taking a course that is too difficult for you will result in not only a lot of frustration, but also low grades. Low grades, even in higher-level courses, are not going to endear you to a college admissions officer. It is important, however, to take courses at the highest level at which you can perform well and still maintain good grades. Unfortunately, when course selection time comes around, many students take the same courses that everyone else in their class takes, which essentially keeps them at the same academic level. Take some time to think about and make sure your course levels are serving you well, both for your education and for your college application. If they’re not, think about making a change; that is, either increasing or decreasing the level. As I just said, making sure that you take courses at the highest academic level at which you can perform well is important. Here’s one way to figure that out. For each course you’re taking now, ask yourself the following two questions. You’ll probably find that you’re not putting the same amount of effort into all of your courses. Your effort will probably depend on how easy the subject is for you, how well you like the material, your self-discipline, and your work ethic. Based on your answers to these two questions, here are some actions to consider. Course Level Increase – Subjects in which you’re getting top grades but are making little or no effort in should be candidates for an increase in academic level. To confirm this, you may want to try putting in that effort for a month or two and see what happens to your grades. No Change in Course Level – Subjects in which you’re putting in your maximum work effort and getting good grades should not be considered for any level change. Course Level Decrease – Subjects in which you’re putting in maximum effort and getting average or below average grades (C or D) may be candidates for decreasing your level. This can sometimes happen with honors courses. It’s also a good idea to talk to the teacher of the course in which you’re considering a level change. When course selection time rolls around, teachers often make official level recommendations for the next year, so you want their input. They also know your abilities pretty well and can often give you good advice. When you talk to your teacher, ask for supporting information with questions like, “What specifically makes you think I can’t (can) be successful at the next level?” and “What skills do I need to work on?” This information will be helpful not only in terms of your decision, but also in terms of where you should focus your efforts. If your teacher outright supports your plan, that’s a major reason to go for it. If they are hesitant, this does not mean that you shouldn’t make the change, but you should consider their points and reasoning. Another good way to get data for your decision is to ask a teacher of a higher-level course to show you some of the classwork and homework. Many teachers also list homework on their websites, so that’s another way to get it. Homework usually reflects similar questions asked in class, and you can judge your ability to successfully accomplish the work. With any increase in course level, there’s going to be extra work involved and you’ll need to do it. Higher-level courses will likely also take more of your time, so you’ll need to plan for that. As a note of encouragement, I’ve seen many determined students excel in a higher-level course even though their teachers did not believe they could handle the work. Sometimes it had to do with the course material, sometimes they ended up with a teacher who better fit their learning style, or they just decided that they were going to buckle down and do the work. The key is to be prepared to put in the effort and time. If you are able to successfully increase the academic level of one of your courses early in your high school career, you may discover that you can easily handle the level and take more of those courses the following year. That, in turn, will provide you with a better education and lead to a transcript that is much more attractive to college admissions officers. Now, even though courses at different levels are designed for students with different abilities, there are a couple of other important factors that determine success. Those factors are . . . work ethic, discipline and perseverance. In over 25 years in education, as both a teacher and an administrator, I can attest to the fact that work ethic, discipline and perseverance have a huge impact on how you perform and, as a result, on how successful you are. I have seen many students with those attributes get good grades in a course level higher than their abilities. On the flip side, I’ve seen even more students not apply themselves and get lackluster grades in course levels below their abilities. A second factor is personality. If you’re someone who gets anxious easily and frets over every detail, attempting a more challenging course may not be a good idea. The additional stress may carry over and affect your other courses. Bottom line . . . Make an informed decision. There are some other courses that colleges like to see on your college application. These are college-level courses so you need to consider whether they’re right for you. AP courses are offered by many high schools and are highly valued by colleges because they are rigorous and considered to be college work. If you are disciplined and can handle the work, they are an excellent way for colleges to see that you can perform at the college level. If your high school does not offer AP courses or doesn’t offer an AP course in the subject in which you’re interested, look for one of the many opportunities available to take AP courses online. Online AP course providers must be approved by the College Board for the course to be considered valid, so it’s important to make sure your provider has been authorized. Taking an online AP course requires a great deal of self-discipline to complete the work. You must also prove that you know the material by taking and doing well on the AP exam for the course. IB courses are also rigorous and are viewed by colleges in a similar light as AP courses. Not as many high schools offer them, but if your high school does, they are worth looking into. If your high school offers dual credit courses (also called dual enrollment courses), this is yet another way to show admissions officers that you can perform college-level work. Dual credit courses are college courses that are usually sponsored by a college or the state college system, but are offered at your high school and taught by your high school teachers. These are actual college courses for which, in addition to receiving high school credit, you can receive college credit. To get official college credit, the college usually requires you to register and pay for the course as though you were a part-time student. In exchange, the college will provide you with an official college transcript with the course, credit and your grade, and you can send that transcript as part of your college admissions application. Taking one of these courses is a fantastic way to demonstrate to a college that you can perform at the college level, and you don’t even have to leave your high school. Middle school students experiencing course selection for the first time will need to be especially careful in selecting their courses and levels. Many students come from middle schools where everyone is in the same class level. As a result, they have no idea what academic level to select for high school classes. Normally, your middle school teachers will make recommendations as to the course level they think you should be in. If you think you want to try a higher level than the one they recommend, they should be the first person you speak with. Another good strategy is to talk to your future high school guidance counselor. They will have first-hand knowledge of the middle-school-to-high-school transition and the courses offered at the high school and may be better able to help you with that decision. Even though this is a post about course selection, there’s something else you need to consider when making your decisions, and that consideration is the grades you’ll get. You shouldn’t increase the level of your classes if you don’t think the extra work will result in good grades. In other words, a “C” in an honors-level course is not as good as an “A” in a college-prep-level class. If you get a “C,” the college doesn’t really know whether you mastered the material and are ready for college courses in that same subject. This is particularly true for courses like math that depend on previous knowledge. The “C” also doesn’t tell them about your work ethic. You may have put in more work to get that “C” than in any other course, but an admissions officer has no way of knowing that. An “A,” on the other hand, communicates hard work, discipline, effort and knowledge of the course material. The high school courses you select can have a big impact on your college application and your education. Colleges want to see you take the most challenging courses you can handle. The course selection process is where you make decisions about the courses you take and the difficulty of those courses. In this post we’ve offered a few strategies for gathering information that can help you make those decisions and select courses at the right level of challenge. I hope these strategies help you with your course selection process.